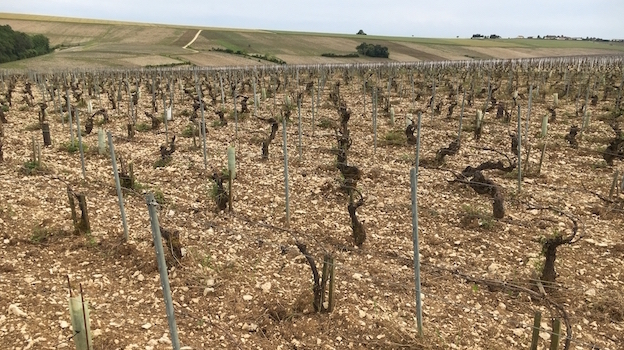 During the first half of this decade, growers in Chablis enjoyed better luck with the weather than did their colleagues on the Côte de Beaune. But, for many, their lucky streak ran out in 2015, when a very promising and precocious crop of grapes was pounded by a hailstorm just days before the harvest was set to start. That weather event was just a taste of what was to come in 2016, when the worst spring frost in decades, followed by two widespread and extremely damaging hailstorms in May, reduced much of the region to a non-smoking ruin. Only the Grand Cru slope and some right bank premier cru vineyards at the center of the Chablis appellation escaped relatively unscathed; elsewhere, there was pain aplenty for nearly everyone, with some producers predicting that their 2016 production would be cut by 60% to 70%--or more. And that was weeks before the flowering even began! Because the buds that will become next year’s crop originate during this year’s flowering, production in 2017 is also likely to be significantly affected. This is not good news for future Chablis availability or pricing. 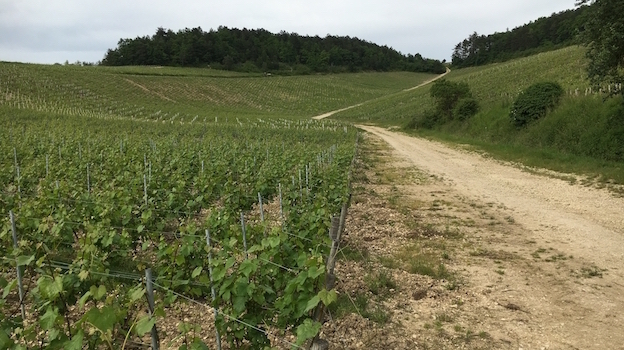 My annual tour of the Chablis vignoble in early June took place under cool, overcast conditions, with the producers just beginning to come to grips with the disastrous spring of 2016. Growers were facing a busy summer of work in the vines, with the likelihood of relatively little payoff at the end. Where the vineyards are normally a sea of green at the beginning of June, large swaths of Chablis were stripped virtually bare of their vegetation. But it was the 2015s and 2014s that I was in the region to taste. Following a warmer than average March, an exceptionally warm April and a moderate May, the flowering took place early and in a rush under warm, sunny conditions during the first half of June, with a hot period on June 4, 5 and 6 (I was there, sweating) getting things off to an explosive start. The stage was set for a copious crop of evenly ripe grapes. June continued much warmer than average, with a sharp and prolonged heat spike during the last few days of the month and first week of July causing sunburn in some of the most exposed sites. There was another, shorter heat spike in the middle of July and temperatures for the month were again higher than normal. August remained very warm, with several more short jolts of heat, particularly one at the end of the month. But it’s important to note that, compared to the Côte d’Or, the high summer temperatures in Chablis were somewhat less extreme compared to the long-term average, and the Chablis region had a bit more beneficial rain in June, July and August than the Côte d’Or (and especially the Mâconnais and Beaujolais). But in Chablis, the end-of-August heat wave was broken in spectacular fashion by the storm on the night of August 31/September 1. The hail began in Préhy and Courgis, moved up to the Valvan valley, brushing much of the greater Vaillons hillside as well as Montmains, and then did its most severe and highest-visibility damage to vineyards in the Grand Crus Clos and Blanchots and the super-Premier Cru Montée de Tonnerre. The storm marked the end of summer: virtually overnight, the thermometer plummeted from the 90s to the low 70s, and temperatures remained pleasantly cool through the harvest and beyond. The week of September 14 turned dull and showery but by then the harvest was virtually over. The hailstorm hit literally a few days before the harvest was slated to begin. Most growers waited a day or two for the vines to dry out (the hail had been accompanied by heavy rain—as much as four inches in some spots) but had no choice but to pick the hail-affected vines quickly thereafter, before the grape skins began to rot. Most of the producers affected by hail claimed that the thick-skinned grapes were relatively little affected by off tastes, especially where the fruit was quickly picked and sorted. But relatively little of this fruit had reached full ripeness by the time emergency measures needed to be taken. And quickly assembling a team of pickers so early in September was often a logistical nightmare. Some producers I visited in early June said that they only had to advance the start of the harvest by two or three days owing to the hail; but that assessment often understates the potential effect on the hail-beset vineyards, which under ordinary circumstances would not have been among the first to be picked. In fact, growers who began picking as early as September 2 or 3 frequently admitted that they were forced to bring in the hailed-on grapes as much as a week earlier than they would have liked. Of course, they also pointed out that had the hail struck two weeks earlier, the affected vines would not have produced any usable fruit. The hail had other complicating effects on the harvest of 2015. In this very warm growing season, had conditions remained hot, dry and storm-free, some estates might well have harvested too late. In fact, it’s quite possible that many wines made from fruit brought in early will turn out to be fresher than the average 2015, perhaps with less depth and dimension than they might otherwise have had—and, according to a number of growers, somewhat lower alcohol—but with more minerality and energy and thus more Chablis typicity. On the other hand, because growers often struggled to mobilize their picking teams and were forced to devote all available manpower to harvesting the vines that were affected by hail, in numerous cases they may have picked their other vineyards later than they might otherwise have done, risking even higher sugar levels in the grapes and, more likely, lower acidity. Happily, the night of hail and rain marked an end to the summer heat and temperatures in September returned to normal levels for the season, which helped to preserve acidity. Needless to say, the very warm, sunny summer weather burned off most of the malic acidity in the grapes; in some sites, conditions were extreme enough to retard the ripening process. But sporadic, well-timed rains in Chablis went a long way to preventing widespread hydric stress. While some growers acidified and others blocked at least a portion of their malolactic fermentations to preserve freshness in their wines, most preferred to allow the vintage to express itself, maintaining that levels of the more stable tartaric acidity were perfectly adequate for making fresh, balanced wines. 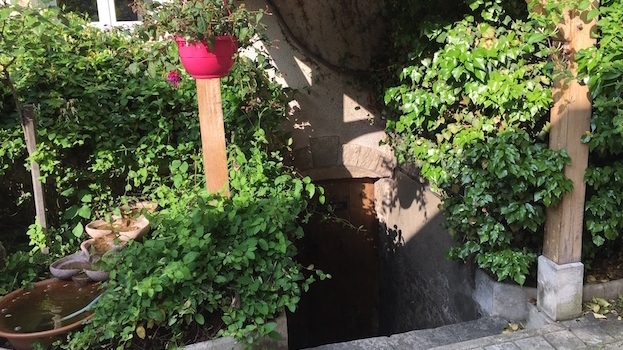 As on the Côte de Beaune, pHs in 2015 were rarely excessively high, even where total acidity levels were low, and with little malic acidity to be converted to lactic during the secondary fermentations, the wines did not change dramatically. As a general rule, the alcoholic and malolactic fermentations went quickly, in many cases finishing by the end of 2015. Quick sugar fermentations often resulted in very dry wines, sometimes topheavy with alcohol. But a minority of growers told me that their sugar-laden grapes took longer than usual to finish fermenting. And less-efficient fermentations with wild yeasts may have resulted in more complex wines with a bit less alcohol than they would ordinarily have had, and that was all to the good in 2015. The 2015s are very solaire­ in style, with considerably higher than average potential alcohol levels requiring little if any chaptalization. The wines are clean, pure and rich, favoring stone and citrus fruits over minerality, as is typical of a warm, sunny year. If they rarely show the high-pitched crushed stone and ineffable floral and herbal topnotes of the cooler 2014s, the vintage’s successes do not lack for freshness. The potential downside to the vintage, besides its mostly low acidity, is high alcohol, which can dull the wines’ perfume and overwhelm underlying soil character, at least in the early going. While most growers compared their 2015s to past warm years like 2009, 2005 and 2003, they emphasized that the newest crop of wines is much more classic than the extreme year of 2003 and is much less likely to display exotic or otherwise exaggerated aromas. Still, the 2015s typically privilege varietal fruit character over minerality and many wines display notes of menthol and anise, along with some alcoholic warmth. There’s a slightly bitter quality to some wines that represents something of a wild card for this vintage. Some growers attribute this characteristic to the thick-skinned grapes and the strong dry extract and tannins in the wines, while others believe it is a function of the way the wines’ underlying minerality combines with their alcohol. But for the moment, it’s limiting the early appeal and complexity of many 2015s. 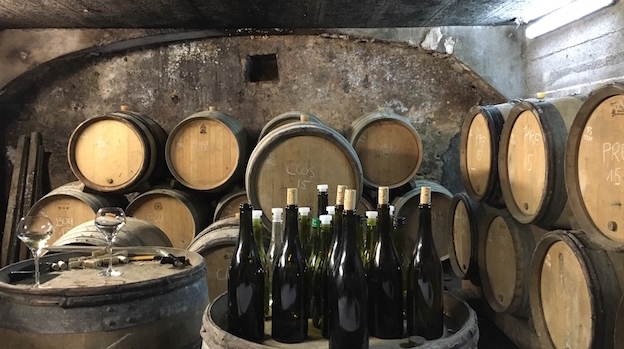 It is clear that the majority of 2015s will be best suited for relatively early drinking owing to their fully ripe fruit, considerable body, pliancy of texture and soft acidity, and Chablis traditionalists may well find that the vintage and varietal character displayed by most ’15s overshadow the region’s distinctive terroirs. But the vintage’s better wines have the stuffing and verve for mid-term aging, and these wines should show more distinction and mineral cut as they burn off some of their baby fat and absorb some of their alcohol. And of course wines made from some top vineyards picked early owing to hail (especially Clos, Blanchots and Montée de Tonnerre) are often much less marked by the hot vintage. Two thousand fourteen is a splendid Chablis vintage that should please connoisseurs and neophytes alike. The wines were made from ripe, healthy fruit with bright natural acidity, and the better examples of the vintage offer a lovely combination of aromatic freshness and complexity, with elements of citrus and stone fruits, flowers and fresh herbs, serious density of material, piquant saline minerality and firm, long finishes. Although these wines are more pliant and less austere than the best vintages of a generation ago, they are in the line of cooler recent years like 2012, 2010 and 2008. 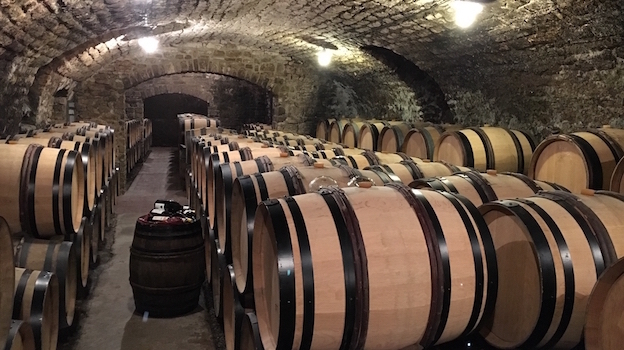 Most cru bottlings from 2014 call for at least a couple years to harmonize in bottle and gain in complexity, with the most backward examples, especially Grand Crus, in need of longer patience. The vintage’s better examples should last very well: 5 to 8 years for village wines, 6 to 12 for Premier Crus and 8 to 18 for Grand Crus as a rough rule. Unlike in 2015, many warm sites benefitted from the cooler, longer growing season of 2014, as their fruit slowly reached full ripeness and gained in density and complexity without loss of acidity or particularly high grape sugars. Early pickers often found that their grapes were not totally ripe and still had high levels of acidity. There was a rainy day (September 21) in the middle of the harvest, but most growers believe that it was beneficial for softening the grape skins and finishing the ripening process following weeks of very dry weather beginning in late August. Unlike in 2013, when heavy rains in early October came just a few days after the start of the harvest, the grapes in 2014 remained healthy and free of rot, showing little of the surmaturité or exotic character of the ‘13s. Estates made little use of their sorting tables in 2014 and even less in 2015 in the vineyards that were not touched by the hailstorm. Yields were solid but hardly excessive in 2014, due in part to some evaporation of water in the grapes during the hot, dry weeks leading up to the harvest. Production levels were generally somewhat higher in 2005 as the flowering was particularly successful, but the growers I visited rarely admitted to making the full allowable yields. And of course production in vineyards in the path of the hailstorm was often cut dramatically. 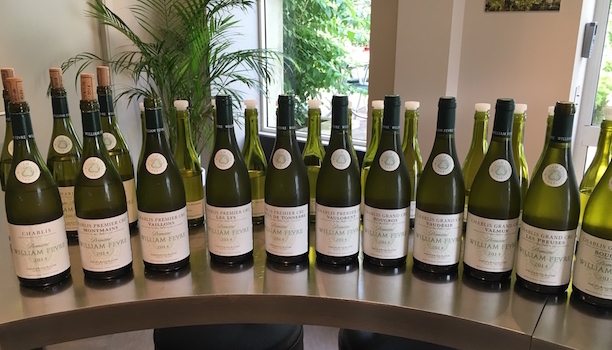 I tasted the overwhelming majority of the wines covered in this article in Chablis in early June, then sampled additional wines (early-bottled ‘15s as well as numerous ‘14s) in New York in recent weeks.